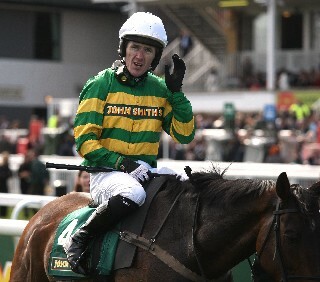 Irish racing legend Tony McCoy finally won his first ever Grand National aboard Don't Push it when he came home ahead at Aintree from Irish challenger Black Appalachi. The Grand National is the English equivalent of the Kentucky Derby the biggest horse race in the English calendar. It was an all-Irish win as the horse , trained in England, was owned by legendary owner JP McManus and trained by County Cork born John Joe O'Neill.There was a huge gamble on the horse in the half hour before the race and he ended up joint favorite at 10/1. McCoy, acknowledged as the greatest steeplechase jockey ever, had somehow never won a Grand National in 14 attempts but he put it right on this day day with a superb ride, bringing the horse to challenge long time leader Black Appalachi at the last fence in the 4 miles two furlong marathon and stretching out to win by two lenghts on the long run in. The usally ice cool McCoy was deeply emotional after the win He had only picked the horse from a choice of four mounts at the last minute.